A “university medalist” from Panjab University, the batch of 2004. Mr. Gupta’s comprehensive knowledge on various subjects of law stems from a good 12 years of litigation practice experience and a remarkable association with worldly-wise and distinguished lawyers. Mr. Ashutosh Gupta is a registered law practitioner with the Bar Council of Punjab and Haryana and is also a member in good standing. 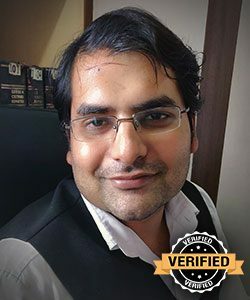 Under the mentorship of designated senior advocates of the Punjab and Haryana High Court, Mr. Gupta has had the opportunity to handle a plethora of legal disputes in the nature of Civil, Criminal, Arbitration, Service law, Matrimonial Disputes, Consumer matters, etc. Mr. Gupta is known for his remarkable diligence and effective handling of lawsuits. His early stages of career had him meticulously invest himself in complex legal disputes. With bigger and tougher challenges, the scope and knowledge broadened and Mr. Gupta emerged as one of the best lawyers in Chandigarh for Writ matters. Litigants who seek a dedicated advocate for writ matters in Chandigarh High Court, Mr. Gupta is sure a good contender. Mr. Gupta is at the designation of Senior Associate Advocate at one of the law firm in Chandigarh – B&B Associates LLP and aspires to bring a positive change in the field of law with his dedicated efforts. Mr. Gupta dedicates his full time into the profession and works 6 days a week. Work timings: 10:00 am to 06:00 pm IST. Mon-Sat. (Sunday – reserved for urgent and prior appointments).